Schoenberg’s opera Moses und Aron is unknown musical territory for many – true too for most if not all of Schoenberg’s music and that of his fellow Second Viennese School composers, Berg and Webern. The case is the same for recent operas in the Linbury Studio Theatre, such as Quartett, Through His Teeth or The Killing Flower. More mainstream is Berg’s Wozzeck, recently performed on the Covent Garden main stage by The Royal Opera; but even this has not become as familiar as operas from the same time or even after, such as Britten's Peter Grimes. Why is it that some works appeal more immediately and more broadly than others? When we hear the phrase ‘we know what we like’, it often means ‘we like what we know’. The new is almost always more draining than the familiar as we need to concentrate on how to assimilate what is strange and unknown. And because human nature is generally risk-averse, it means we can be slow to accept or even actively resistant to the unfamiliar. The effort of comprehending the unfamiliar can sometimes be more than we want to invest – especially if we expect to use culture for relaxation or diversion. The challenge of convention and familiarity is one part of how art works: the emotional effect and the intellectual interest can come from expectations we have of one thing happening, but the work doing something slightly or dramatically different. That deviation from our expectations provokes a reaction – and some people are open to more provocation than others, which contributes to our personal tastes. But how does this work in regards to music? Music is built on a use of pitch and rhythm that we assimilate from our cultural background. Although it is often stated that music is a universal language, it clearly isn’t. The same basic elements can be put together in very different ways, and require different ways of listening. We need to learn and become familiar with what these conventions are. Then we can get ‘inside’ the sound and follow what the composer (or equivalent) is doing with more confidence. This is not to say that anything we don’t like will become a much-loved favourite. Far from it – music can still be well or badly done wherever it comes from. The point is that so many elements go into listening to music new to us, that we can be worn down by the sheer overwhelming novelty of the experience. Ultimately, everyone in the audience will have their own response, made up of how much is familiar or unfamiliar, how much they enjoy a challenge, how alert or tired they are. They may be engrossed or bored, enlivened or enraged: the best thing an audience can do is respond in whatever way they feel. But sometimes, a little context picked up beforehand – through discovering the story, listening to the composer's music, or through reading others' responses to the work – can be enough to counteract the alienation created by the unknown to make a lot of difference to our enjoyment of the performance. 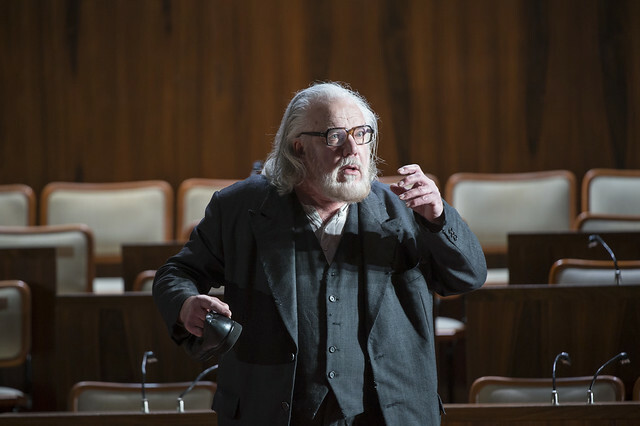 Welsh National Opera performs Moses und Aron on the Royal Opera House's main stage 25–26 July 2014. Tickets are still available. Dredging up bad reviews of Beethoven is, I'm afraid, the oldest tactic in the book to defend the unpopularity of modernist composers - Moses und Aaron was written nearly a hundred years ago so if people still don't like it or want to listen to it, it's because the music fails to create an idiom which can appeal to the average listener. It would be helpful if the ROH website could provide an actual set of listening tips - eg themes, overall structure, instrumentation - which could help people get on top of the score rather than just telling us to listen to it a bit! We'll be posting more content over the coming days to highlight the themes, structure and the music of the piece. Do keep an eye out for them! Actually, listening to it strikes me as the best way of getting to know this incredible opera. How else do you approach music and how did you discover that you liked whatever your favourite music is in the first place? This opera really isn't difficult and you don't need to have a degree in music to find it exciting, gripping and beautiful. I'd recommend starting at the beginning, or maybe at the interlude "Wo ist Moses", or the finale to the first Act, but I found myself gripped by the sounds from the beginning and that I ended up wanting to get to know it better. Far too many people dismiss Schoenberg through reputation having barely heard a piece he's written. I found it highly accessible, late romantic music. If you can cope with Wozzeck or Stravinsky this is no more difficult and is hugely rewarding. The WNO were great but I'd love it if the ROH itself were to give it a go one day soon.